House MD Episode Guide: Season 3 #307 "Son of a Coma Guy"
Third Season Episodes :: #307 "Son of a Coma Guy"
The team (Oar Peps, Lima Edelstein, Jess Spence and Jennifer Morris on) does not support House when he decides to wake a coma patient with a controversial drug cocktail in the HOUSE episode "Son of Coma Guy" airing Tuesday, No. 14 (9:00-10:00 PM ET/PT) on FOX. A guy, whose father is in a vegetative state in the hospital. The son exhibits symptoms and House causes a seizure as a test. He then develops kidney and liver failure, possibly from the medications, and he begins to slide into coma. House keeps thinking it is genetic but all of the things he has them test for turn out negative. So to learn about the kid's genes House decides to wake the father. Then he thinks its mercury. But finally he returns to genetic causes. All the while the son is getting worse until when House solves the puzzle, the son cannot be saved without a new heart and since he is an alcoholic, he has no chance of getting on the transplant list. Chase was sent to the patient's home. Wilson lied to the cops (previous episode but continued here). Oh, and House gave advice to a man planning suicide and Wilson helped by trying to establish an alibi. Ragged red fiber. "It's an inherited condition." 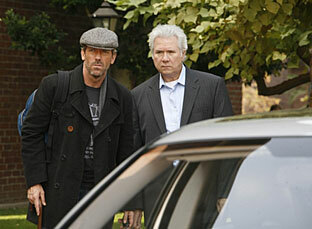 House (Hugh Laurie) wakes a coma patient (guest star John Larroquette), and agrees to accompany him on a roadtrip in the HOUSE episode "Son of Coma Guy" airing Tuesday, No. 14 (9:00-10:00 PM ET/PT) on FOX. Cast: Hugh Laurie as Dr. Gregory House; Lima Edelstein as Dr. Lima Cuddy; Oar Peps as Dr. Eric Foreman; Robert Sean Leonard as Dr. James Wilson; Jennifer Morris on as Dr. Allison Cameron; Jess Spence as Dr. Robert Chase. Guest Cast: David Morse as Michael Tritter; John Larroquette as Gabe; Zeb Newman as Kyle; Holly Kaplan as Woman; Jonathan Strait as Fake House; Bobbin Bergstrom as Nurse. 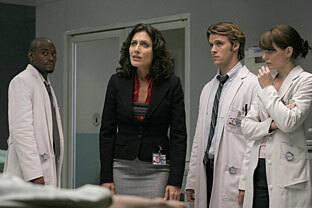 Wilson, questioned by the police officer in the last episode, is annoyed with House. "You stole my prescription pad and you forged my name." "What did you tell the cops?" "I lied. They'd have put you away for ten years. After they took your license to practice medicine." "I lied to the cops!" "There is no case unless they can prove that either I got the drugs illegally or I sold them illegally. I didn't do the second. You lied about the first. Game over.... Important thing is you keep prescribing the same amount of drugs to me. Or it'll look suspicious." "Here's another way to look at it. Having forced me to lie to the police, your first concern is securing your 'drug-connection'!" House wonders how deep was the awareness of someone who has been in a vegetative state for ten years, "Pick up scraps of conversations? You have the vague sense that the hospital administrator dresses like a trollop? Or that the new 'Star Wars' movies were a disappointment?" Wilson tells House, "Rumor in the cafeteria was that Caustic Guy was waking up Coma Guy." "Technically, Vegetative State Guy was woken by— yeah, Caustic Guy." "Gotta get him a steak, before I can ask him anymore questions." "He doesn't wanna talk about his son?" "Didn't seem to emotionally register that his son is sick." "Brain issue? He was asphyxiated. Spent ten years as asparagus. Who knows what damage is in there?" "It's possible. 'Course always the simple explanation. Maybe he just doesn't like his son." "Only in your world would that be simple." "The delusion that fathering a child installs a permanent geyser of unconditional love—"
"Yes. Well, of course. That would play into your romantic vision of human—"
"Terms you would understand. We have an evolutionary incentive to sacrifice for our offspring, our tribe, our friends. Keep them safe." "Except for all the people who don't. Everything is conditional. You just can't always anticipate the conditions." "This is like trying to control the weather, but I would prefer it if that you don't eat in the car. I just had it detailed." The guy who was in a vegetative state agrees to answer questions if he gets to ask them of House and he asks, "Have you ever been in love?" "Ever love anybody else?" House never answers this. The guy who was in a vegetative state asks Wilson why he his so concerned about him. House answers, "Deep inside Wilson believes that if he cares enough, he will never die." Wilson to the guy they are now traveling with to answer a question he asks about House, "If you each had one day to live, you'd look for one last meal and House would look for one last answer." Wilson to House, "Why steal my pad?" "Oh my god. You're right. I'm an addict. Thanks for opening my eyes." "No, I mean, why my pad. Foreman, Cameron and Chase's pads are just as convenient. But their association with you is involuntary. They're employees. I associate with you through choice. And any relationship that involves choice you have to see how far you can push before it breaks.... And one day our friendship will break. And that'll just prove your theory that relationships are conditional and you don't need human connection or deserve it or whatever goes on in that rat maze of your brain." House: "Wilson, get out.... You've lied to the cops enough for me. Maybe I don't want to push this until it breaks." The patient who is about to kill himself so his son can have his heart and can't think of what to tell his son, asks House, "If you could hear one thing from your father, what would it be?" "I'd want him to say, 'you were right, you did the right thing.'" At the end, House goes up to Wilson and says, "You know what I found interesting about this case?" "That it proved people can love unconditionally and you can tell yourself it's not true, but you'll just end up in a hotel room in Atlantic City, asking someone to cut your heart out?" "The hoagie. You thought this guy was emotionally confused and the hoagie was just a mask to hide his real feelings towards his son." "It was. Did you know Tritter was talking to your team while we were away?" "Yeah. Yet you moved heaven and earth to get him that mask with mustard and proscuitto." "Which one of them told you?" "All of them. Which means that none of them said anything that I have to worry about. Back to the hoagie. You think that my addiction's out of hand? Your need to be needed is so strong that you give people what they want, what they need, what they think they need." "I don't think my enabling is anything you should be complaining about." Also see: House's quote about why he became a doctor.